Kinetic Essays » Ghost Architecture versus the Land of Beige. Great forms of beauty often remain unseen, unsung, and unnoticed. There are, for example, large urban stretches of Philadelphian architecture that should count among the most beautiful miles in the world… Only “beautiful” in the Surrealist sense of the word— as convulsive beauty. Arcane beauty. Beauty that, in the moment of its apprehension, verges on a mild horror that makes your eyes go misty. 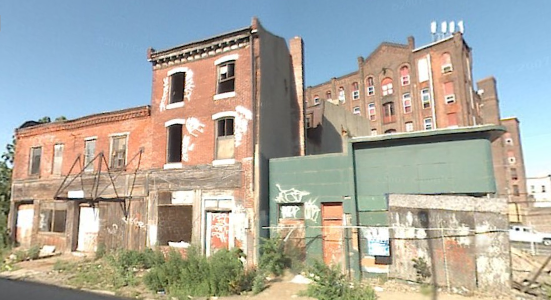 Beauty hidden in the forgotten and war-torn and collapsing sections of greater Phildelphia. The industrial Northeast. The far-flung West. The crazed South and Southwest. Where Philadelphian architecture really gets beautifully convulsive. Rich in architectural bricolage and terse, accidental color palettes. An elegance burnt to form by suffering, by desperation and stupid decisions, by a sloppy madness that knows not what. An urban rustic. Stray minarets and fori romani, full of loitering opium-eaters. City blocks, at length, eroded and sculpted by drug addiction. Ugly needs graphed in plaster and wood. This is subconscious architecture, dream architecture, where mythos has easily replaced simple, honest, useful form… Ghost architecture. 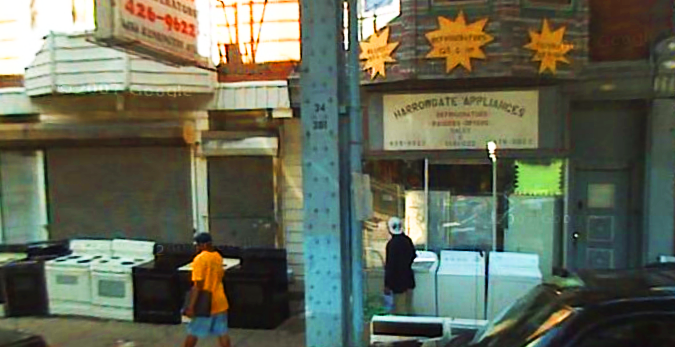 Architecture that wears its own conscious and subconscious history, in layers, in piles… Occasionally happy, North Philadelphian Fat-Albert poverty. Bazaar logics at work. Mystery as in Dionysian mystery. Mystery as in murder mystery. Wet garbage. Clots of white paper, and webs of significance. Human nests. Wasted Adrenaline. Look around and just beyond the lots. 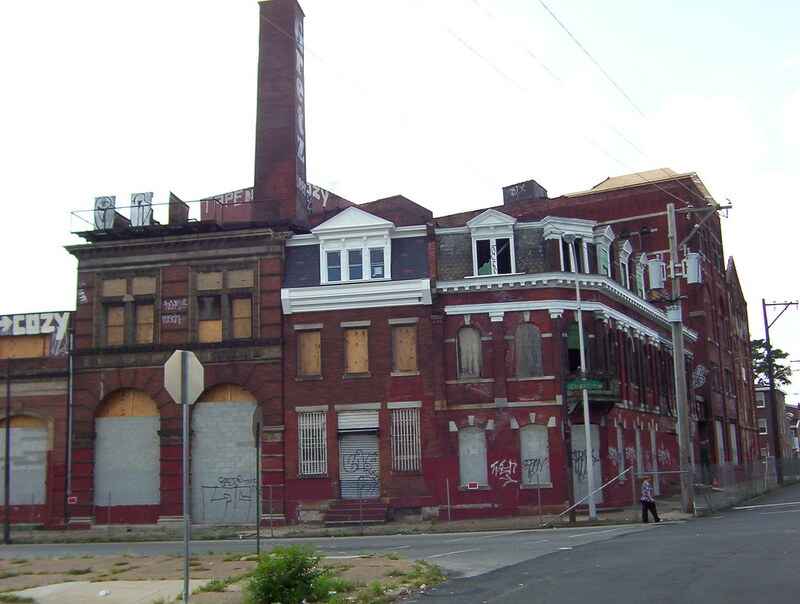 In the lost regions of Philadelphia, and similar cities, architecture grows in total freedom. Outside of Care and, therefore, outside of Control. What kind of flowers of evil should we expect to grow here? What kind of wild kudzu? Such unchecked and ludicrous events. Check-cashing available next to liquor emporiums. Kenzo loonies soapboxing about sports, weather, and current events. Weird white banquet halls full of well-dressed Dominicans. Appliance stores that copy keys and hem pants and lend money. In situations like these, I have to speak for myself, and neither for the rich nor the poor. To really appreciate ghost architecture correctly, you need a brattier and impractical outlook on things and forms. The practicality and practicability of design and construction— which ask hellishly exacting economic, legal, and neighborly considerations of the makers and takers— have no such demands on beauty and appreciation. We can surrender to absolute irresponsibility, to total mythos. We can lose ourselves and love those buildings set in a vernacular of death, collapse, wretchedness, danger, and abuse. Though instead of saying architectural appreciation— which sounds too dainty, too swathed in architectural history— let’s speak about the experience of architecture. Architecture taken as result, resource, ride, collision, Erfarhung, rather than intent and expression. Ghost architecture openly encourages delirium, unfeasibility, and grandeur. Approach the forms as you would natural beauty. The glacier, cloud, and mountain range are not weighed for design or expression. They are natural arrangements. 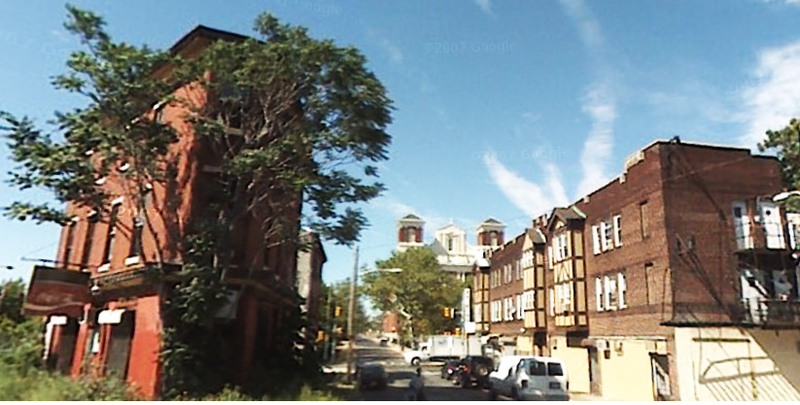 Here, in North Philadelphia, architecture crops up rudely like lichen on the dead and dying things of previous industry. Real organicism and truthful process. Nevertheless, like the Piranesi etchings of Roman ruin, I would urge the viewer, the stroller, or the agent not just to think about these images as mediations on fleeting gloria mundi— on lost promise —but rather as a matter of mythos momentarily replacing history. As images of a newly-grown arcane beauty, inspiring not for what it once was, but what it has now become in its earthy, overgrown grandeur. Piranesi did not see an overly-demanding Order in Rome. He saw abundance and enchantment, and selling Goethe on the idea and inspiring the Italian Journey. This arcane beauty is threatened by any and all renovation, by city-planning, by the well-intentioned, and most tragically, by the encroachment and annexation by the Land of Beige. What is this Land of Beige? You know very well what I’m talking about: the portion of the map controlled by medians and calculated unoffensiveness. Northern Virginia. Ardmore. Upscale shopping centers. Condominiums exorcising old mill buildings, making them clean and safe and hospitable, free of ghosts. Busybody democracy stamping the land with its sensibilities. Standards of living may rise, but something still dies in the process, however good, however bad, politically, morally, or economically. Beauty is the first to go with renewal and renovation. It is nice to have a clean place to go, once in a while, but where should we draw the line? I suppose I can wait until the headlines warn of a “wasteland depletion” in the Philadelphian wilderness.